Since 2006, this annual four day writing retreat has catalyzed faculty writing about the Scholarship of Teaching and Learning (SoTL). Participants meet off-campus for four consecutive days at the start of the summer to write and to exchange feedback on drafts. Balancing dedicated time for faculty writing with small group feedback on drafts, these intensive summer retreats help faculty make the crucial, and often difficult, step of going public with their SoTL research. We welcome Residency applications from faculty writers at any stage of their writing projects—from beginning ideas to completed drafts. Applicants, however, must be available for all four days to focus on their writing and must be working on projects that they can further develop through the residency activities (dedicated time/space for writing and daily feedback from colleagues). Residency participants meet daily at Timberlake Farms, a local environmental education foundation. This serene setting offers a nature preserve with walking trails, a “treehouse” with three comfortable small-group spaces spread across two levels, porches and a picturesque view of a pond. While this setting is deep in the woods, Timberlake Farms is only 10 miles from campus and is easy to reach on local highways. There are modern bathroom facilities and a full kitchen. Timberlake works with a local caterer to provide coffee, tea, and pastries for the morning and lunches at mid-day. 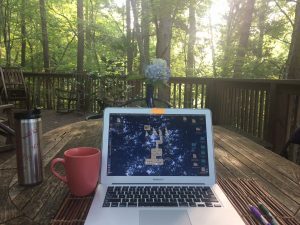 The 2019 Writing Residency is scheduled for June 3rd – June 6th, 2019. Applications are due by 5:00 PM on Friday, April 5th, 2019. For more information about the residency, contact Deandra Little, or Kristina Meinking. To date, approximately 65% of Faculty Writing Residency participants have published their residency projects in peer-reviewed publications. (Faculty looking for publication venues for their SoTL projects can review this list of SoTL Journals.) Beyond publication outcomes, the residencies have helped faculty fine-tune their writing habits, connected colleagues from across campus for ongoing writing groups, and inspired participants’ renewed motivation to pursue SoTL research agendas. Adamson, Sophie. “Community-based Learning: Reaching Beyond the Classroom Walls.” The Language Educator, vol. 7, no. 2, 2012. Adamson, Sophie. “Plantu and Pedagogy: The Draw of Editorial Cartoons in the Classroom.” The French Review, vol. 85, no. 8, 2012. Auman, Corinne. “Using Simulation Games to Increase Student and Instructor Engagement.” College Teaching, vol. 59, no. 4, 2011, pp. 154-161. Carpenter, J.P. “Pre-service teachers’ micro-blogging: Professional development via Twitter.” Contemporary Issues in Technology and Teacher Education, vol. 15, no. 2, 2015, pp. 209-234. Felten, Peter, Jessie Moore, and Michael Strickland. “Faculty Writing Residencies: Supporting Scholarly Writing and Teaching.” Journal on Centers for Teaching and Learning, vol. 1, no. 1, 2009, pp. 39-56. Holmes, Ashley J. “Advancing Campus-Community Partnerships: Standpoint Theory and Course Re-Design.” Reflections: Writing, Service-Learning, and Community Literacy, vol. 8, no. 3, 2009, pp. 76-98. Isaac, Megan. “‘I Hate Group Work!’ Social Loafers, Indignant Peers, and the Drama of the Classroom.” English Journal, vol. 101, no. 4, 2012, pp. 83-89. Kearns, Lauren W. “Somatics in Action: How ‘I Feel Three-Dimensional and Real’ Improves Danced Education and Training.” Journal of Dance Education, vol. 10, no. 2, 2010, pp. 35-40. Kupatadze, Ketevan. “Course Redesign with Student-Faculty Partnership: A Reflection on Opportunities and Vulnerabilities.” Teaching and Learning Together in Higher Education, vol. 24, 2018. Myers, Janet and Mary Jo Festle. “Getting More for Less: When Downsizing in Honors Yields Growth.”Journal of the National Collegiate Honors Council, vol. 8, no. 2, 2007. Palfy, Cora. “Instructing a Range of Experiences within the Music Theory Classroom.” The Routledge Companion to Music Theory Pedagogy, Edited by Leigh Van Handel, Routledge Press, 2019. Patch, Paula. “The Danger of Polite Silence: Five Strategies for Getting Students to Talk to One Another.” National Council of Teachers of English, 2018. Peters, Toddie. “Teaching for Social Justice: Creating a Context for Transformation.” Journal for Cultural and Religious Theory, vol. 12, no. 2, 2012, pp. 215-227. Pyne, Kim. “Reading and College Readiness.” Educational Leadership, vol. 69, 2012. Pope-Ruark, Rebecca. “Know Thy Audience: Helping Students Engage a Threshold Concept Using Audience-Based Pedagogy.” International Journal for the Scholarship of Teaching and Learning, vol. 5, no. 1, 2011. Russell, Alan. “A Model for Undergraduate Research in Statistics Education.” International Journal for the Scholarship of Teaching and Learning, vol. 4, no. 2, 2010. Shively, Kim. “Point of View: An Exploration of One Meisner Teacher’s Journey to Character Development.” The Players’ Journal, 2018. Train, Tonya Laakko and Yuko J. Miyamoto. “Encouraging Science Communication in an Undergraduate Curriculum Improves Students’ Perceptions and Confidence.” Journal of College Science Teaching, vol. 46, no. 4, 2017, pp. 76-83. Note to Writing Residency Alumni: We love celebrating your accomplishments. Please email us your citations so that we can add them to this list.